The number of swift-water rescues increased for the second year in a row in Calgary, and officials are reminding Calgarians to be cautious if they head out on the rivers. 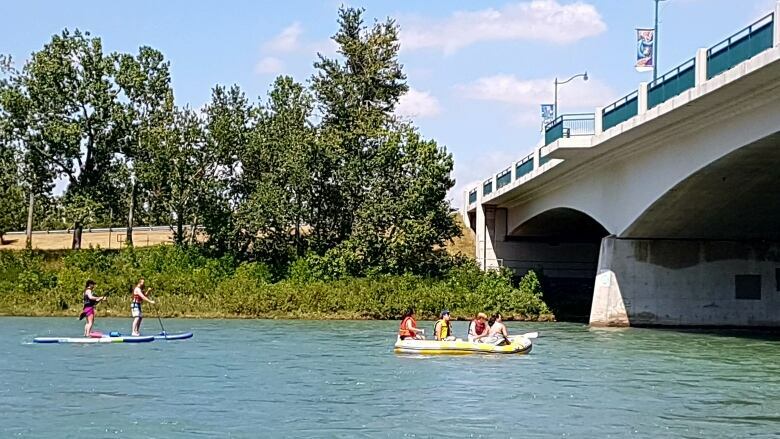 The number of Calgary swift-water rescues jumped in one year, prompting officials to remind people to be cautious if they head out on the rivers. Between 2016 and 2017, the number of swift-water rescues increased by 30 per cent. The Calgary Fire Department said they responded to 30 calls for help in 2016 and 70 calls for help in 2017. The department doesn't track patient outcomes, so it can't report the exact number of people rescued. "Where there's water, there's risk," department spokesperson Carol Henke wrote in a press release issued Thursday. "The importance of life-jackets, even in shallow, slow-moving water, cannot be exaggerated." The fine for not wearing a life-jacket on Calgary's waterways is $500. If you were thinking of floating down the Bow in an inner-tube, beer in hand, think again. Consuming alcohol or drugs on a watercraft is also illegal in Calgary, and can net you a $115 fine. "Alcohol and drugs impair your judgment on the water much like it does on the road," Calgary police Staff Sgt. Shawn Wallace said in the release. "With all the unexpected situations people can encounter on the water, impairment from drugs or alcohol will make it that much more difficult to react." Officials cautioned those that are heading out on the water to be prepared. Check river flows and familiarize yourself with features with the Harvey Passage or waves near the 10th Street Bridge in advance, for example.